Perhaps the greatest innovation in water heater technology, in the past few decades has been that of the tankless water heater. The tankless water heater provides the consumer with several benefits such as saving space, reducing the gas bill, and making the entire system much more efficient and robust. 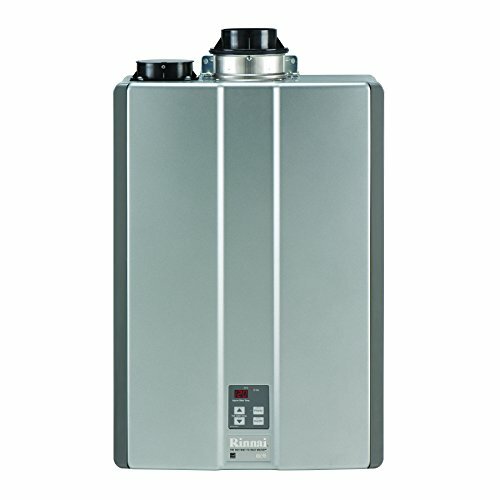 Rheem tankless water heaters are one of the most famous and most widely accepted water heaters on the market. Rheem’s has the best after-sales services and high-quality products. The respect that Rheem has been able to command in the short time of their existence has truly been phenomenal. When buying a Rheem tankless water heaters, it is imperative to keep in mind a few necessary factors. This list will be helpful as it will influence your overall gas bill, your comfort, and your product’s reliability and usage. The RTG-95DVLN from Rheem is a gas powered tankless water heater with a capacity of 9.5 GPM. The unit is ideal for indoor purposes, and it comes with a direct vent as well. It is 94% energy efficient and features a stainless steel heat exchanger for condensing. The heater is equipped with automatic settings that are designed to improve safety along with energy and cost efficiency. The heater is certified by Air-conditioning, Heating and Refrigeration Institute (AHRI) for its energy efficiency. You can use up to 38 feet of three-inch wide PVC pipe or can also opt for five feet of 2-inch PVC as well. It is a Low NOX version, and it will not overly consume the fuel. The unit is equipped with a self-diagnostic system for your convenience in installation and maintenance. It has a digital display that shows maintenance codes and temperature settings and comes with a 2-pipe design for a direct vent PVC system. There is a built-in electric blower, and an overheat film wrap to protect it from overheating. If you have many users of hot water, then you can opt for EZ-Link Cable as well as heavy-duty applications and link up two units and make them operate as one. With the help of this connection you and connect up to six units. If you want to cater even more demand, then go for an optional MIC-185 and MICS-180 control assembly and manifold up to 20 units. You can also operate this unit conveniently if you live in a high altitude, 9840 feet above sea level and freeze protection over up to -30 degrees. Your purchase of cold indoor models will also include a remote control along with a 10-foot thermostat cable. The RTG-84XLN Rheem has a capacity of 8.4 GPM with a thirty-five-degree rise. Due to its construction and size, it is ideal for various indoor purposes but you can use it in your outdoors as well. The unit comes with a UX-117 remote control along with a ten feet wire for the thermostat. Like the previous model mentioned in this article, the RTG-84XLN is also a low NOX version and consume less natural gas for maximum efficiency. An ideal option to get hot water for your home, the RTG-84XLN is highly energy and cost efficient, and saves space as well. It is equipped with a next-generation burner technology with a flow rate of 0.26 GPM. The venting system of this water heater comes with the unit so you can use it in the outdoors. If you want it indoor, then you must vent it outside. Nevertheless, the installation is a breeze if you go for setting it up in your outdoors because you won’t have to make much effort for the venting system. Setting it up indoor will also need a bit more space because you need to connect your electricity, water, and gas supply lines with it as well. In addition to all, you can even get plenty of help from the instruction manual if you are opting for a DIY project. The RTX-13 tankless unit from Rheem is another best option for residential use. It comes with a fully adjustable external thermostat with digital controls and an LED display that shows temperature with -/+ 1-degree accuracy. It also features copper immersion that is highly durable and two separate heating elements. The power control is self-modulating and fully serviceable. Its installation is a breeze with an electric cable that is three feet long and your purchase will also include ½ NPT adapters along with ½ inch water connections for compression. The water heater is capable of providing you with 99.8% efficiency while you can make adjustments to the controls with small increments of 1-degree as well. It also features a water saver shower head with a capacity of 1.5 GPM. Its installation, replacement, and maintenance are quick as well. The small-sized RTX-13 works great, if you have a small household or a small family. It comes with digital temperature control that makes it easy to set the water temperature you need. It not only enables you to save space and time but is also very efficient towards conserving energy and cost. You don’t require any installation expertise because maintenance of this unit is quite convenient. The only issue is that this tankless unit doesn’t come with any energy conservation certification, but that doesn’t mean that it is low in performance. This unit can still drop your utility bills up to 30% which is a huge bonus. The temperature adjustment will never let you run out of hot water when in need and you don’t have to invest much either. 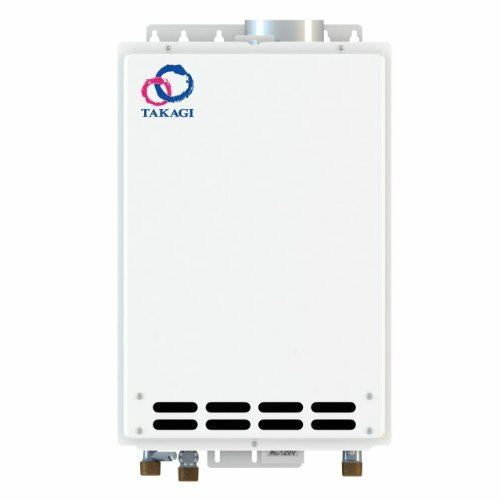 The RTG-64DVLN indoor tankless model comes with a direct vent system and is a low NOX version. It runs on natural gas and is ideal for indoor use. Its vent system is directly connected to the unit. The tankless unit has a capacity of 6.4 GPM with a 35-degree rise. The unit comes with a 10-feet cable for the thermostat and UC-117 remote control. It also features an integrated condensate collector and a concentric vent system either in 3-inch size or 5-inch size. The minimum flow rate for activation of this unit is 0.40 GPMwhile the minimum flow rate is 0.26 GPM. You can also incorporate high demand application using your EZ-Link cable. 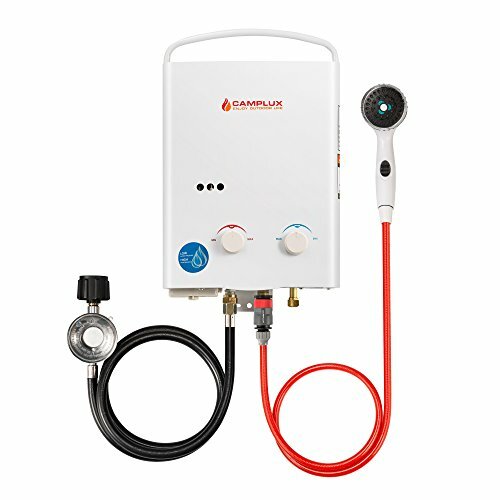 It will allow you to connect multiple tankless water heaters with your unit to operate as a single unit. The unit is certified by EnergyStar and is one of the most energy efficient units that you can find on the market. You must make sure to install it with a 3-inch or 5-inch diameter Category III Coaxial (UL approved) vent pipe that is designed for stainless steel appliances and optimal performance. You can also use any concentric vent pipe supported by the water heater manufacturers with this unit. You can replace your old unit with the RTG-64DVLN and forget about the rest. If you don’t have any specialized equipment to recirculate the water, this unit will take the same time to turn on before your faucet to deliver. The significant advantage is that you will never run out of hot water ever again. Even the smallest unit like RTG-64DVLN is good enough for a house that is 4000 square feet in size. Rheem seems to continue delivering exceptional water heaters to its consumers, and the RTGH-95DVLP is no different either. It has a capacity of 9.5 GPM and is ideal for indoor use. It also features a direct vent system which makes installation and maintenance a breeze. The RTGH-95DVLP is up to 94% more energy efficient as compared to the units of same capacity. It also features highly intelligent electronic controls that are designed to increase safety and accuracy. The energy efficiency is achieved through the heat exchangers made of stainless steel for condensation. The unit is certified by Air conditioning, Heating and Refrigerating Institute (AHRI) and you can use a 2-inch PVC pipe five feet in length or a three inch PVC pipe thirty-eight feet in length with this unit. Like other units, the RTGH-95DVLP is also a low NOX version. This unit can run on 0.26 GPM of flow rate while its minimum activation flow rate is 0.40 GPM. It is best suited for three bathroom homes and comes with a compact space saving design. It is equipped with a self-diagnostic system that comes in very handy during installation and maintenance. The digital display shows maintenance codes and temperature settings. Their direct vent system is made to house two PVC pipes, and it also comes with an electric blower. If you are a DIY individual, then you can use the instruction manual that comes with your purchase. You can also use an EZ-Link cable if you want to cater to increasing demand and add more high demand appliances to work with your heater as one unit. You can manifold your system up to 20 units without any issue using this connection. The RheemRTEX-18 is packed with elegance and high-quality performance. This product not only heats up running water almost instantly but can also control the temperature of the water, allowing you to tailor your water supply to your needs. The device has an external thermostatic regulator, which displays the temperature of the water inside up to a 1-degree accuracy. The RheemRTEX-18 is powered by electricity and heats up rapidly due to the use of two highly conductive copper heating elements, which transfer heat to the water. One of the many things that we love about this tankless model is, unlike most others, very easy to install. This makes the RheemRTEX-18 extremely user-friendly and favors better for users who do not wish to spend hours in installation. Rheem has taken extra care to keep even differently abled users happy! There are several ¾ NPT water connections at the bottom which can easily be plugged into. The water will enter the device and leave within seconds, already warmed and heated to your heart’s desire. The RTEX-18 has also been designed to be lightweight, weighing only a mere 8.5 pounds. The product is 19 inches high, however, and may take up more space than originally planned. But rest assured, the RheemRTEX-18 is definitely the most perfect solution to all your heating needs! This heater is corded, and does not have the same level of convenience that non-corded water heaters have. But that drawback is made up for by the fact that this heater can consume up to 7 gallons of water in the same time. To add to that, the Rheem has a voltage of 240 Volts, making it essentially powerful but moderate and safe. Warranty: 12 yr heat exchanger, 5 year parts and 1 year labor. Rheem’s RTG-84DVP is a powerful tool, producing up to 180,000 BTUs in a single use. This model is made to create coordination and better interactions between the user and the machine. This device has a minimum activation waterflow rate of 4.0 GPM, and a minimum of 2.6 GPM. For people who love to conserve energy and avoid heavy taxes, this is the perfect water heater, as it is both energy efficient and tax-friendly. One of the many features that we love about this Rheem heater is that it can be remote controlled, which makes it all the more convenient and easy to use. However, there is a lack of controls, and the water cannot be heated however much you want. So the temperature usually just stays the same. But we do love how this product has a UMC-117 remote control. Moreover, this unit is also very frugal when it comes to emitting toxic Nitrous Oxide gas. Most propane powered tankless units emit a highly toxic and environmentally degrading level of Nitrous Oxide, and many can even be banned for use if the emissions are excessive. However, the RTG-84DVP emits a very minimal amount of this gas, making it exceptionally safe and eco-friendly. The RTG-84DVP weighs 62 pounds, which is pretty heavy, and has a height of about 23.6 inches. The exact details of the warranty are unknown, but it is known that there is a 12-year warranty on the heating elements and a 5-year warranty on the other parts. This is what makes the RTG-84DVP a better and more reliable option than regular tankless water heaters. The 10-feet long thermostat wire only provides better and faster heating, and hot water makes its way to your taps. This water heater comes fully equipped with low Nitrous Oxide emissions and a UMC-117 remote control. There isn’t much known about this product, but we’ve done some in-depth research to disclose more information about it. Firstly, the Rheem unit has a great and elegant design. Not only does it have a very smooth metal finish, but the overall shape and size of the product are user-friendly. Additionally, it weighs around 54 pounds, which is moderately heavy, and is 26 inches high. This makes the product easier to install and use, but the weight might be a drawback. What we do love about the RTG-95XLN is that it has almost zero Nitrous Oxide emissions. Although powered by natural gas, the harmful gas emissions are an all-time low, to protect the people, their pets, and the environment in general. This Rheem product has also been certified by Energy Star. Additionally, it is a corded device that is great at reducing the power consumption and reduce the chances of breakdowns and malfunctions that regular battery-powered heaters pose. But most importantly, the machine can supply up to 9.5 GPM, with a 35degree rise, making it one of the more efficient and powerful heaters. The minimum flow rate measured 2.6 Gallons Per Minute, which is the most optimal you can get in this brand of tankless water heaters. And the warranty? It differs, but mostly it can range anywhere from 1 to 10 years. This Rheem heater only has one power source, so it may not be as powerful as the others, but we believe that even one source is enough for this machine. The Rheem Tankless Propane water heater is an outdoor tankless unit. The outdoor unit ensures maximum safety at your place around children and pets. The installation needs to be with a direct venting system which is why outdoors is most recommended for safety. This water heater has the ability to heat water at a 35-degree rise with 8.4 GPM. The rise makes it highly suitable for a house or even an apartment. The minimum flow is about 0.26 GPM that is highly suitable to mix water as well. The next generation burner technology allows the heater to be safer and more sufficient. This tankless propane water heater needs an electricity connection since it has an electric ignition. The electric ignition brings about a lot of convenience but the requirement of an outdoor electric connection may be difficult for people in apartments. One of the best and most convenient parts of this tankless propane heating system is that is can run on a remote control at a certain range. This feature allows the user to easily control the system without worrying about going outside over and over again and without going near the system. Nitrous Oxide which is one of the biggest problems in regular propane heating system is taken care of in this unit. It is free from nitrous oxide and makes it safe for the environment and to the people that might be close to this unit and maybe inhaling it. The maximum BTU for this system is about 180,000 which mean that you can be provided unlimited hot water as long as the system is running. You can find a 10 feet thermostat wire with this water heater for your convenience. 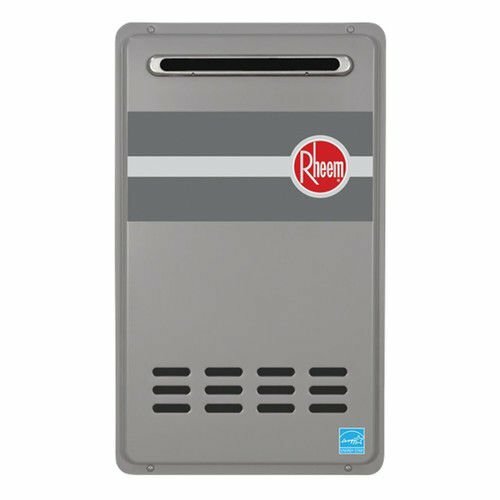 The Rheem RTG-95 XLP tankless propane water heater runs on propane gas and for safety and security against any gas accidents, it is made for an outdoor installation. It starts with an electrical ignition that may be difficult for uses such as at camping, in apartments and other small places. However, the electrical ignition ensures a safe and easy start. For a further convenience over this water heater, a remote control system is provided that can be used to control the temperature and power of the heater without having to fiddle with it every time. The installation of this water heater is very easy as the box has everything that you will need including a 10-foot thermostat wire. This unit is set to provide about 9.5 GPM at a 35-degree rise. This calculation makes it perfect for a house with about 3 bathrooms to get hot water at the same time. The maximum temperature set on this system is about 140 degrees which is more than enough for houses, apartments, and basically any other residential needs. The burner technology is the best in the industry and is very durable for this system. At about 0.26 GPM minimum flow, this system provides a balance to the water heating system. External venting in this system is not required since it is designed to be installed outdoors; however, in rare cases, it can install in garage type places where there is direct outdoor ventilation. The only thing that is possibly missing is the pressure relief safety system in the unit otherwise it is a full package. This Rheem Indoor natural gas heater requires a direct ventilation system for the convenience of installing it indoors. The direct ventilation allows the heater to be safe when installed indoors like in apartments or small houses. It runs on natural gas that can be acquired from an additional system or directly connected to the main system. There is an EZ cable system with this heater. This system is used to connect two of these systems to increase the range of water heating around the house and to treat both units as one. This tankless heating system has the ability to be installed at high elevation as well like inside apartments. It is an energy saving unit which makes it friendly to the environment as well. There is a freeze protection of up to -30 degrees which makes it suitable for places that are extremely cold as well. Although the unit is installed indoors,but for added convenience, it comes with a remote control to easily gauge through the settings without having to fiddle with the unit directly. The heater provides a flow rate of 3.9 GPM with a 45 degrees rise that makes it suitable for flats, small houses, RVs, camping, and other small temporary living spaces. This unit is made with an overheat film wrap that protects the unit from overheating and causing accidents. It saves space with its compact design and can be installed in bathrooms easily without having to worry about space. The system is free from nitrous oxide fumes that makes it very safe to be indoors as you will not inhaling harmful fumes and causing a problem for your family’s health. The self-diagnostic system display in this unit allows the regulation of temperature and the reading are very clear. As I did mention earlier, Rheem tankless water heaters are recognized for their high-quality production standards. Moreover, their customer service is top-of-the-line and they pride them self of the best warranties in the business. In order to understand what makes Rheem a good pick for your budget, lets have a look at what the Rheem brand has to offer. There are numerous types of water heaters which are offered and Rheem has been the foremost pioneer of providing world-class tankless water heaters at the best price and comfort. 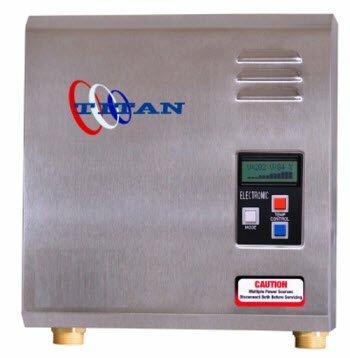 When choosing a tankless water heater, you should consider the different types of water heaters which Rheem has to offer and what kind of benefits each of these provides. It is usually preferred by consumers to buy tankless water heaters which run on gas rather than other fuel such as electricity or other fuels. Rheem offers a dynamic array of tankless water heaters; these are very economical water heaters and they are the preferred choice of consumers who wish to place these water heaters inside their residential homes or apartments. These operate on gas so unless you live in a colder region, they will be extremely reliable due to the near constant supply of gas and the lower the gas bill. If you live in a colder region where it snows a lot, or it is generally very cold in that area, then the electric tankless water heaters are the best choice for you. The gas alternative is not feasible for a colder region since gas supply is limited and very inconvenient in colder regions, therefore, electric water heaters are the best option. Rheem has carefully manufactured and designed their electric tankless water heaters to save more electricity. Of course, there is no guarantee of how much electricity you will be saving, but Rheem has estimated that it can save 30% to 40% more on the electricity bill as compared to their competitor’s water heaters. The mid-efficiency tankless water heaters are the future of tankless water heater technology. While the other options are great at what they do and may provide optimum efficiency to you, they are generally compromising on quality. 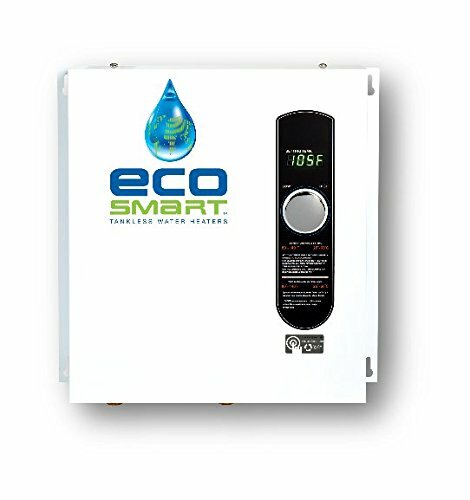 The mid-efficiency tankless water heaters provide the perfect balance between fuel efficiency as well as performance. The Rheem brand offers a limited range of mid-efficiency water heaters that are guaranteed to save up to 70% energy as compared to when you use other alternatives. Although, this type of tankless water heater is not very inexpensive, it is still affordable for some and works very efficiently. The one-time investment can bring about future benefits. The installation cost of your tankless water heater depends greatly on the type of water heater which you have installed in your residence or commercial area. Usually the cost of installation also varies from vendor to vendor, but Rheem provides the services to install the water heater. From a normal vendor, the cost to properly make connections and install the tankless water heater from a vendor ranges from around $2,000 to $4,000 depending on the type of water heater bought. However, if you purchase the tankless water heater directly from Rheem manufacturing, the cost is almost halved or reduced to a significantly lesser value. Rheem has hired experts that aid in the installation process and also guides you on how to properly install your plumbing and water heater in order to get the maximum benefit out of it. Another very important factor which you must keep in mind is that you might need to radically rethink about replacing your old plumbing with a new one, in case you had an old water heater installed. We would recommend to use Rheem’s expert’s advice on the plumbing situation as they will provide the complete plumbing plan. You might need new PVC pipes to make the connection from the main tank to the water heater, and then may need more connections from the water heater to several water outlets within the vicinity. If you want to relocate the water tank to a different place as compared to the old one, then it is recommended by Rheem to install newer plumbing or pipes. When it comes to tankless water heaters, efficiency is extremely important. The tankless water heaters can be generally categorized into two main efficiency types: the condensing type and the non-condensing type. Each has its own benefit. Rheem offers both condensing and non-condensing tankless water heaters with top-quality maintenance checks. 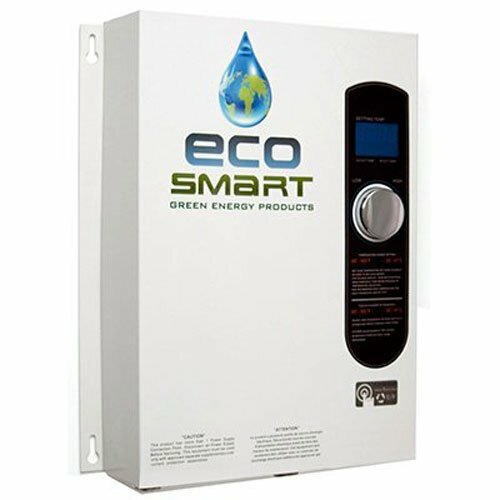 These are considered the more expensive and modern kind of tankless water heaters as they have an efficiency factor of 0.92-0.95. The Rheem’s condensing tankless water heaters use a system of double heat exchanges. After the first heat exchange is executed, the water heater then performs a second heat exchange of the waste or unused energy thereby increasing its own efficiency by a large margin. The non-condensing type of water heaters is older and cheaper. But, the major drawback of these tankless water heaters is the fact that they have an efficiency rating of around 0.82-0.86. The Rheem’s non-condensing water heaters consist of a single heat exchange which results in lower efficiency. However, because they utilize an older method and technology, their price is not as expensive and they are easily affordable and available. 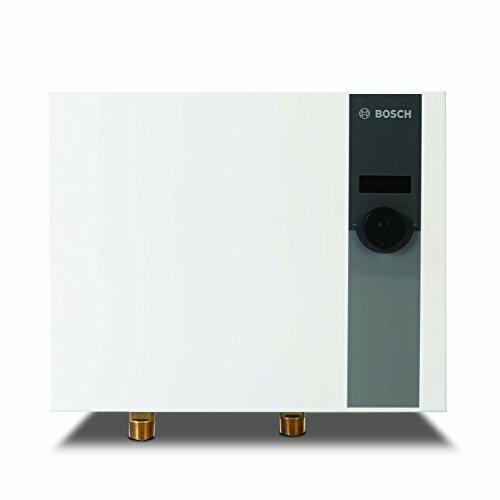 The size of the tankless water heaters is dependent on several factors of these water heaters. Firstly, it is imperative to calculate the amount of heat that is to be used and the rise in temperature you will need as these factors will affect the efficiency and reliability of these tankless water heaters. It is good practice to always plan for an undersized water heater because it is much more economical and reliable to use. Secondly, you should calculate the flow rate and the number of devices that will be connected to the water heater. Add all of the devices’ total flow rate and the outcome will be the flow rate which you should opt for in your water heater. Rheem’s expert engineers and workers will properly guide you on how to determine the demand size of the tankless water heater. This is due to the fact that the calculations for the capacity and size are too complex for a layman to calculate. If you wish to have fast access to hot water and do not want to wait a long time for hot water to flow, then it is best to ask for a tankless water heater that can be placed inside the bathroom or somewhere near the bathroom so that that the hot water is easily accessible. Rheem offers consultancy services that can advise you where to place the tankless water heater. Rheem also has a large catalog of smaller heaters that can easily be placed anywhere. I hope that you will benefit greatly from this article and will be able to use this information. Rheem is a premium brand that is at the front of innovative and smart technology. Rheem’s products and services are top-class. Their products have amazing warranty offers and several features that are innovative and smart. You can buy any of the Rheem product with confidence.